A delightfully illustrated picture book following a typical day in Ancient Egypt. Follow a little boy as he hurries off to school, watch acrobats tumble through the crowded market, and gather with the crowds by the River Nile to watch the Pharaoh coming home. With simple, engaging text and bright, friendly illustrations this is a delightful introduction to Ancient Egypt which is perfect for reading aloud. This beautifully illustrated picture book captures the essence of ancient Egypt in a simple and interesting way that new and pre-readers will love. I can see how a child learning to read would find these two good books. The pages are wonderfully illustrated and the words simple enough for early readers to build their confidence. I like how, for older children, there are loads of things that can be done with these books to extend learning and lots of talking points to explore. 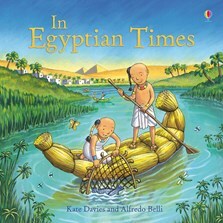 In Egyptian Times is one of the best early history books I’ve found for a two year old.